Acclaimed British actor Bill Nighy has pledged his support for The Invisible Child campaign from Oxfam and Moomin Characters Ltd, by recording a reading of the short story that inspired the campaign for theguardian.com. The Invisible Child campaign aims to help women and girls around the world fight inequality and escape poverty for good, with the full £4.99 price of the special edition book being donated to Oxfam’s women’s projects worldwide. Over £268,000 has already been raised through books sales and The Invisible Child merchandise including a tote bag, tea towel and handkerchief. The Invisible Child is a short story by Moomin creator Tove Jansson, about a little girl who turns invisible after being badly treated by the woman supposedly caring for her. She is given a place to stay at the Moominhouse and, when shown warmth, kindness and respect by the Moomin family, she gradually reappears and regains her place in the world – a right that every woman and girl should have. The fundraising campaign is to support Oxfam’s work fighting extreme poverty and suffering around the world. Since the majority of people living in poverty are women, the rights of women and girls are at the heart of the charity’s work. Long-held prejudices often mean that they are denied basic rights like education, a fair wage or decent working conditions. Women and girls are also often the worst affected when emergencies strike. The music used in the recording is by Finnish musicians Pekka Kuusisto and Samuli Kosminen and is a sample from the upcoming Moominvalley TV animation. The Invisible Child, published by Sort Of Books, is available to buy from Oxfam, Waterstones and the Moomin Shops in Covent Garden and Camden Market. For more information on the Invisible Child campaign, please visit www.oxfam.org.uk/shop/moomins. Photos from Sophia Jansson’s visit to Rwanda to see Oxfam’s work available here. Preti Taneja has won the eleventh annual Desmond Elliott Prize, the “UK’s most prestigious award for first-time novelists” (the Daily Telegraph), it has been announced this evening (20th June). Taneja takes home the £10,000 Prize for her “awe-inspiring” debut novel, We That Are Young, beating fellow shortlisted authors, Gail Honeyman (Eleanor Oliphant is Completely Fine) and Paula Cocozza (How to Be Human). A retelling of Shakespeare’s King Lear set in modern-day India, We That Are Young explores the play’s themes of severed relationships and warring families against the backdrop of the 2011 anti-corruption riots in India. It follows a central cast of characters as they react to ageing patriarch Devraj’s decision to pass control of ‘the Company’ to his three daughters, Gargi, Radha and Sita. The novel was chosen as the best debut of the year by a judging panel chaired by Sarah Perry, author of The Essex Serpent (2016 Waterstones Book of the Year), who was joined by award-winning broadcaster, Samira Ahmed and Waterstones’ head of fiction and publisher liaison, Chris White. Taneja’s triumph marks the second time independent publisher Galley Beggar Press has produced a Desmond Elliott Prize-winning novel. The first was Eimear McBride’s A Girl is a Half-formed Thing in 2014, which also won the Women’s Prize for Fiction and went on to become a major commercial and critical success. The Norwich-based Press publishes just four novels a year and is run by co-founders and husband-and-wife-duo, Sam Jordison and Eloise Millar. 2018 shortlisted authors, Gail Honeyman, Preti Taneja and Paula Cocozza. Before trying her hand at fiction writing, Taneja was a human rights correspondent and reported on Iraq and in Jordan, Rwanda, and Kosovo. Her work has been published in various titles including the Guardian, the New Statesman and Open Democracy. Taneja was born in the UK to Indian parents and spent many childhood holidays in New Delhi. The Desmond Elliott Prize has a track record of spotting exceptionally talented novelists at the very beginning of their careers. Last year, the Prize was awarded to Francis Spufford for his debut novel, Golden Hill, and other past-winners include Lisa McInerney, Claire Fuller and Eimear McBride. Riot Communications, the award-winning culture and entertainment agency, is thrilled to announce it will be working with The Astrid Lindgren Company to celebrate the life and works of the ground-breaking Swedish author, children’s rights campaigner and original Rebel Girl ahead of the 75th anniversary of Pippi Longstocking in 2020. 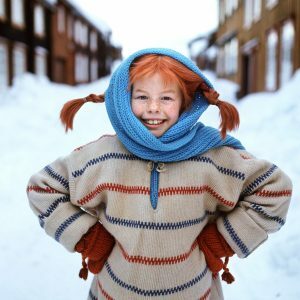 The Pippi books, first published in Sweden in 1945, have sold around 70 million copies in 70 languages and have inspired seven feature films and two TV series, as well as an infinite number of stage productions. Fans of the remarkable redhead range from Lady Gaga (pictured) to Amy Poehler, Lauren Child to Maggie O’Farrell, and ABBA’s Björn Ulvaeus to Studio Ghibli’s Hayao Miyazaki. Working closely with Astrid Lindgren’s family, Riot’s campaign will celebrate Lindgren as a game-changing author, editor, campaigner and social commentator – along with her most famous creation, Pippi, as a thoroughly modern heroine – through a range of cultural and charity initiatives across publishing, stage and screen in the run up to the anniversary in 2020. At Riot, we pride ourselves on being excellent communicators. We’ve won awards that stand testament to that, and clients who return again and again. However, we also know that success comes from constantly honing our skills – even when that means going back to basics. First impressions are critical to the work we do: from pitching to new clients to journalist meetings, winning the talent’s trust to networking with peers. Over the past few years, there has been a focus on empowering professionals – especially women – when it comes to presenting skills and negotiation. TED Talks – such as those by social psychologist Amy Cuddy on body language, and comedian and coach Deborah Frances-White on charisma – are giving us the tools we need to create an impact on our audience, verbally and non-verbally. The science of first impressions is straightforward: an in-built vetting system in our primal brain means that we size people up within 30 seconds of meeting them. What’s often called gut instinct overrides most rational thought and, as with our ancestors, is based on both perceived threat and learnt experience. Think lion vs. prey on the Savannah, but in the boardroom. We judge people on how warm and trustworthy they seem: in fact, understanding someone’s intentions and perceived competency accounts for at least 80% of an overall first impression across all cultures. Your first job on meeting someone is to put them at an ease. Do you have mutual connections? Can you ask them a question about themselves? Can you align your body language to theirs, and ensure you are not giving off hostile non-verbal messages? Crossing arms is a real no-no, as is hiding your hands; maintaining an open posture, showing your palms and holding firm eye contact are all essentials here. Listen and be gracious. However experienced you are, you should always show respect for the time someone’s giving you. Whilst you should always be prepared ahead of a meeting, you should go into every interaction with an open mind and a willingness to listen to another’s agenda and concerns. Bulldozing might work for some, but generally it’s not the answer when it comes to building a long-term relationship. Show an instinct for harmony rather than appearing combative. It’s vital to be aware that your response (verbal and physical) can ramp up or deflate tricky situations: in a difficult negotiation, simple things like retaining an open posture and nodding your head to show you’re absorbing someone’s point (you can return to counter that point later if needs be) are more likely to help you resolve issues and reach the desired outcome. Show interest in the person you’re meeting – it may be a business meeting, but you’re also two human beings interacting. It’s good to engage in a little small talk: research has shown that just five minutes of chat before a negotiation increases the financial value created. Ask informed questions and encourage them to open up and share things about themselves. You can prepare for this by reading a LinkedIn profile, asking mutual connections about them and bringing up any shared interests you might have. No one likes a robot. Your personality and – ideally – a sense of humour will take you from a paint-by-numbers publicist to someone vital and worth listening to. Not full-on Siobhan Sharpe or Malcolm Tucker, but at least someone who has a something to say for themselves. You want to be memorable, and for the right reasons. So there you have it: T.R.I.P. If in doubt, channel Riot heroes Ellen de Generes or Oprah Winfrey. They are masters of non-verbal communication. From now on, we’ll be adopting Oprah’s expansive pose in all future negotiations. ‘We’re going to have a team away day’ is the sort of sentence usually met with universal groans from colleagues as they stare at the 5,000 emails and counting in their inbox and the To Do list running across ten pages. An entire day spent away from the desk can feel like a monumental waste of time (‘Remind me, how is shooting a paint ball at Gary from Accounts’ head contributing to our bottom line again?’). But an away day done right, can have fundamental, long-lasting benefits to the development of an individual, team and business. They can meaningfully bring a team together, inspire honesty, allow for transparency, improve lines of communication, generate ideas and create solutions. We love an away day at Riot. We down tools for the day, put the out of office on and head out to an external venue where we can hunker down to get practical, get inspired and get fat on break-time brownies. A clear purpose to the day is essential. Everyone needs to know exactly what the objective of the day is in advance. The agenda must reflect the purpose and not veer from it. The purpose of our most recent away day was to specifically focus on our new business strategy. The purpose of our next one will be skills consolidation – we’re all going on a negotiation skills course. Everyone in the company has inputted into the agenda of this course for maximum impact. A realistic agenda carefully timed out in advance. The away day is an opportunity for the team not to be racing around feeling rushed, overwhelmed and deadline driven. The away day should create a sense of space and freedom for clear thinking and clear communication. Trying to fit too much in will leave everyone feeling harassed. Set conscious intentions for the day. A powerful exercise to get everyone in the right frame of mind from the off is to ask everyone to share their intention for the day. What do they want to get out of the away day? What quality will aid them in that endeavour e.g. patience/openness/generosity? Lay out picture cards on the floor or pin them to the walls, random images from goldfish to rainbows, the Taj Mahal to a set of keys. Each person chooses a picture that represents their intention and shares it with the team. This picture is kept visible to them all day as a reminder. Come back to the intentions at the end of the day and ask everyone to reflect on how they achieved their intention. Make the day fun, creative, unexpected. Remember the purpose of the day at all times, but within that bring the day alive with exercises, games, activities that challenge and excite. At Riot away days we’ve done everything from the spaghetti tower marshmallow challenge to a rock, paper, scissors championship to creating magazine cover stories. Each activity has fed into our higher purpose but has resulted in lots of laughs, chafed knuckles and tears of frustration. Not your average day in the office. Invite feedback. Finally, always end the day with feedback from the team. 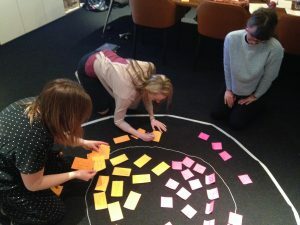 A good old-fashioned bit of circle time is uniting and is a clear indication that you want to learn from your team.